My sermon on Sunday was about the New Temple, and it reminded me of the below blog post that I originally wrote in 2014. Find the sermon video at the bottom. The institutional church itself has reinforced the vocabulary. A couple of years ago, the Bishop corrected me when I referred to my church’s worship space as “the Sanctuary.” He said, “Properly, the sanctuary is the space behind the altar rails and building should be referred to as ‘the church’.” From a technical architectural vocabulary perspective, he was not wrong. New Temple: Life in the Presence – Sermon by the Rev. Charlie Holt from The Church of St John the Divine on Vimeo. Do not doubt, but believe! Life in Christ is Never Dull! The song invites the hearer into response, but no response is given. That generation was skeptical of the invitations of God offered through John the Baptist and Jesus. Hence, they did not dance, and they did not weep. The Gospel writer Luke says that they had “rejected the purpose of God for themselves” (7:30). John the Baptist called them to a baptism of repentance, but they refused to be baptized by him. The prophet sang the dirge, but they did not weep. Jesus proclaimed the Good News of forgiveness and restoration for the sinner and the brokenhearted. He celebrated and ate with them, but they refused to come to the party table. The Lord played the flute, but they did not dance. Today, we celebrate–the Lord’s day of resurrection. Where is your heart on this day? Is it filled with joy? Or have the flaming arrows of the evil one pierced your heart and stolen your joy? Jesus would challenge the skeptical and critical spirits in us. Oh you of little faith! Beware of the negative spirit. It is possible to be so cynical of being taken in that you refuse to enter in to the abundant life that God has for you. Such attitudes rob joy from the people around you. Do you know that an angry and critical spirit is a mask for unresponsiveness to God’s call? Remember, that in refusing to be baptized, the Pharisees “rejected the purposes of God for themselves” (Luke 7:30). Are you humbly responsive to the purposes of God on your life? Are you open and responsive to enter into the joy and free gift of the resurrected life? In the last book of C.S. Lewis Chronicles of Narnia series, there is a group of hard-hearted dwarfs who are pictured in a building surrounded by a glorious banquet prepared for them by Aslan, the Jesus figure in the series. Only, the dwarfs cannot perceive that the food and the table that is set before them as a life-giving, joyous blessing. Their cynicism and skepticism clouds their view of life. Instead of a banquet hall, they perceive that they are in a stable eating hay and drinking out of a water trough. “Their prison is only in their minds, yet they are in that prison; and so afraid of being taken in that they cannot be taken out” (CS Lewis, The Last Battle). It is easy to stand on the sidelines and be a critic of faith and belief in the midst a sinful and fallen world. Faith requires us to open our eyes to reality of God’s kingdom and call. I have noticed that malcontents often find each other and flock together like angry birds. “The dwarfs are for the dwarfs,” they reassure themselves! Yet the group-think only serves to further limit their vision and sharpen their rejection of the life which God is offering them. We all know people like this–perhaps you see yourself in the dwarf tribe! The Lord invites you out of self-imposed darkness into the light of life–the light of Christ, thanks be to God. He has prepared a table before you. Today celebrate and proclaim the breaking forth of the new life to which the Lord invites you. In his resurrection, he has prepared for you a glorious table of life with anointing oil and overflowing cups of abundance. God’s kingdom is one where goodness and mercy pursue you all of your days. 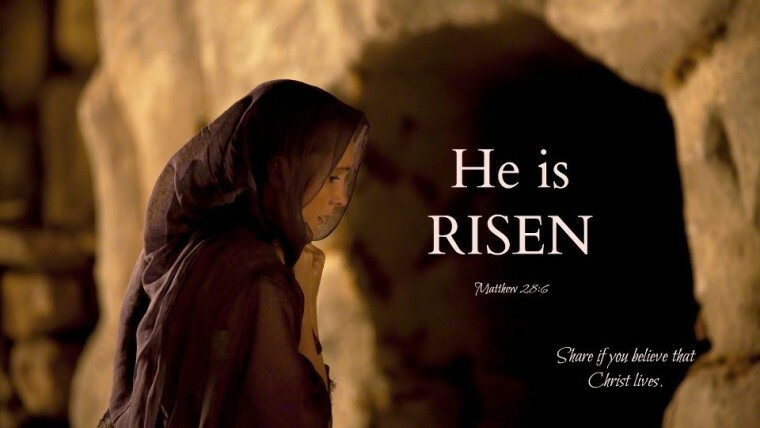 The first witnesses of the empty tomb were several women. They told the disciples and the rest the Good News of new life bursting from the tomb! Now it was Mary Magdalene and Joanna and Mary the mother of James and the other women with them who told these things to the apostles, but these words seemed to them an idle tale, and they did not believe them (Luke 24:10). The women were filled with wonder, joy, faith and belief. But, it was met by the dwarfish skepticism of those who dismissed their words as an idle tale. I ask you, where are you seeing death among things that are alive, and seeking life among things that are dead? The Lord would have you enter into the divine drama as a fully engaged participant. Give your entire heart, life and faith to Him. Surrender to the Lord in prayer right now. Plead with him, “Lord I want to receive your life, where ever you lead me!” The responsive Christian life in Jesus is never dull! The kingdom of God calls you to enter into all the ups and downs of faith, hope and love. At times, the Lord sings the dirge that you might plumb the depths of repentance and weep over your sin and brokenness–this is the season of the Cross. At other times, He plays the flute with a joyous invitation to dance with the rhythmic freedoms of His grace and redemption–the glory of the Resurrection! Today the joyous flute is loudly playing for you. Alleluia, Christ is risen! The Lord is risen indeed, Alleluia! Will you dance with Jesus in faith?